The market of Hania is the most famous in Crete and one of the most important markets in Greece. The indoor market in a hall is open from about 8am to about 6pm (closed sunday and public holidays). You should come between 8 and 11 o'clock in the morning. This is the time the locals go shopping. 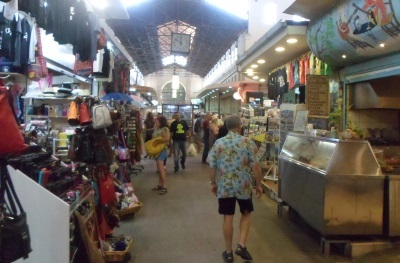 In the afternoon most visitors in the covered market of Chania are tourists. The hall itself is interesting. It was built in 1913 and is similar to the Marseille market in France. The market hall has a star-shaped structure. There is an entrance on each of the 4 sides. The market is much more touristy than one or two decades ago. But many of the goods are still traditional and authentic. In the large hall the offers range from fresh meat, fish, cheese, fruit and vegetables to typical Cretan products. Particularly interesting are, for example, the Cretan spices, the Cretan tea varieties such as the Cretan diktamos, the many different olive (oil) varieties, the wide selection of raki and olive products such as cream and soap. Because of the big competition, most products are cheaper than elsewhere. In particular the fish and the cheese are cheap. There are also some small restaurants, where you can eat traditionally and cheaply. 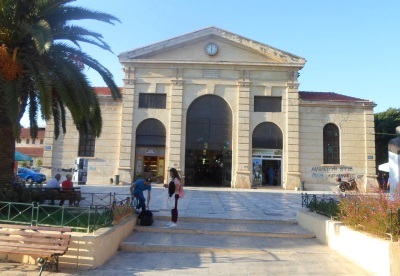 The indoor market is located in the center of the city between Old Town and New Town of Chania, about a 10 minute walk from the bus station or the famous port of Chania.. The most famous product of the island of Crete is the olive oil. There are about 20 million olive trees on the largest island of Greece. Every year, hundreds of millions of liters of olive oil are produced. For the economy of Crete the production of oil from olives is after tourism the most important economic sector. 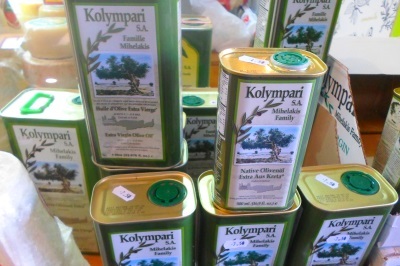 In the market-hall in Chania you can buy olive oil at several booths. In the picture are canisters with oil from the village Kolymbari, about 20 km west of Chania. Another classic of Crete is honey. 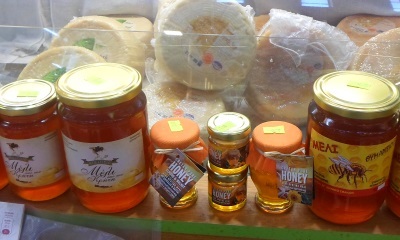 Many honey varieties from Crete are among the best in Europe. The many wild flowers on the island give the honey a very special taste. 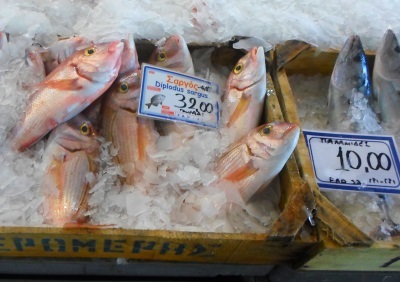 Several market stalls in the market of Chania offer freshly caught fish from the sea around Crete. For tourists the many different species are interesting. Also olives are offered. The inhabitants of Crete are very familiar with the most important agricultural product on Crete. 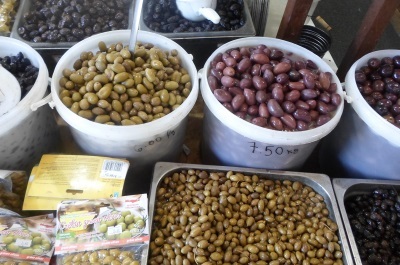 The locals know the names of the different varieties of olives. Perhaps the most important product, which exists only in Crete, is diktamos. From the plant, which grows only in the high mountains of Crete, the locals make a tea. 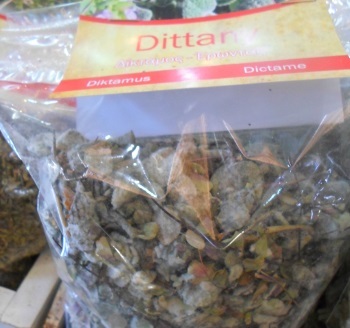 In Crete the diktamos is considered to be a medicinal plant. It is always part of a cretan mountain tea. The cheese at the market of Chania is very interesting. Crete is famous for its soft feta. The soft cheese is usually made from sheep's milk, sometimes also from goat's milk. Also the hard cheese Graviera is popular on the island and can be bought in the covered market of Chania. It is a sheep's cheese, often with the addition of goat's milk. Of course, there are also local fruits and vegetables. Typical for Crete are, for example, grapes, oranges, lemons, pomegranates in autumn, cherries in late May and June, pears, apples, tomatoes and cucumbers. Delicious are the fresh locals figs in August. Special offers for tourists in the market hall include, for example, Aloe Vera products, leather goods such as bags, books (guide books..) and souvenirs. A visit to the Market Hall of Chania should never be without lunch. About six small restaurants in the hall offer traditional Cretan dishes. Most of the clients in the tavernas are locals. The food is very reasonably priced. We had excellent octopus with chips, rice and onion for only about 7 euro (year 2019). It is best to go to the tavern where many locals are. One of the restaurants specializes in seafood. Near the market is the great Football Museum Crete of the Greek National Team. Also there is a great Chania Lighthouse and the Maritime Museum Crete.